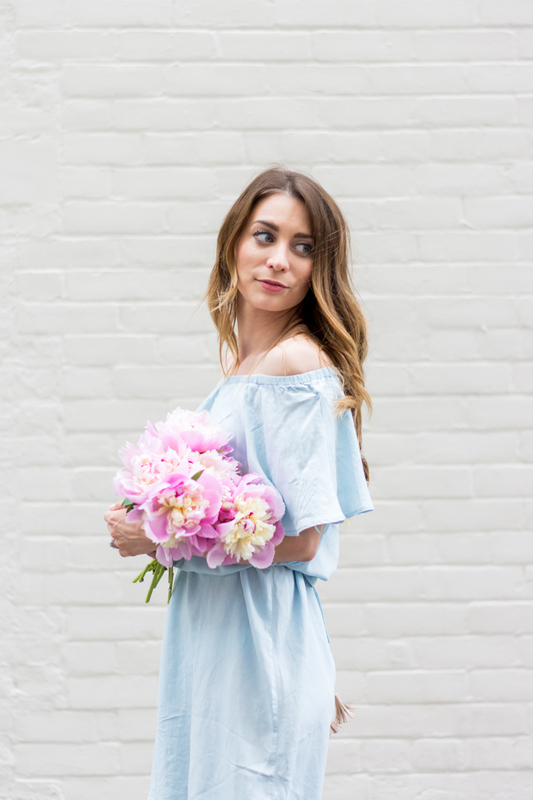 OOTD - Blue Off The Shoulder Dress | La Petite Noob | A Toronto-Based Fashion and Lifestyle Blog. I think it's officially time to celebrate the warm weather without worrying about jinxing it: Summer is here to stay! You guys know that I'm a sucker for a cute dress; I find dresses to be the perfect summer outfit since they're an outfit within themselves and are so comfortable. With the off-the-shoulder trend taking off, I was so happy to find this cute blue number from Old Navy. I love how the dress comes with a belting option, which makes it perfect for us petites: you can essentially adjust the length of the dress to meet your needs. Paired with a blush pink bucket bag and some on-trend clogs, this is definitely a go-to summer weekend or evening outfit for me. You guys know that I always have a story about my bags, so here it goes. I had been coveting a certain high-end bucket bag for months (cough - Mansur Gavriel) but could never seem to get my hands on one of these coveted bucket bags. When I was turned onto Hieleven and their gorgeous pink bucket bag, I couldn't believe it - it's very similar, if not better in my opinion! I really appreciate the feet at the bottom of the bag, especially since it's such a light colour, and the tassels are absolutely adorable. Made from a high quality leather and super practical, I've forgotten all about my previous designer desire. What do you guys think? Are you celebrating the summer weather as well, or do you prefer another season? 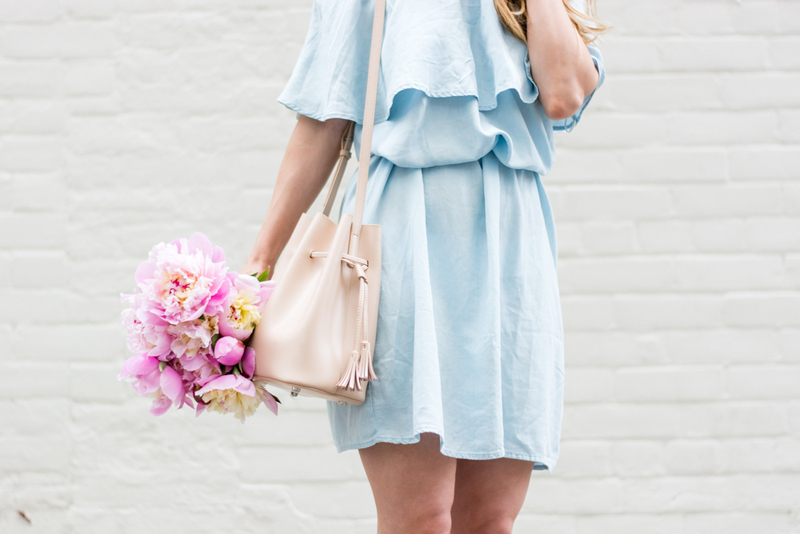 What's your thoughts on the bucket bag and off-the-shoulder trend? Let me know! oh I am all over summer weather and intend on celebrating everyday. Love this look on you and those flowers! Gorgeous. 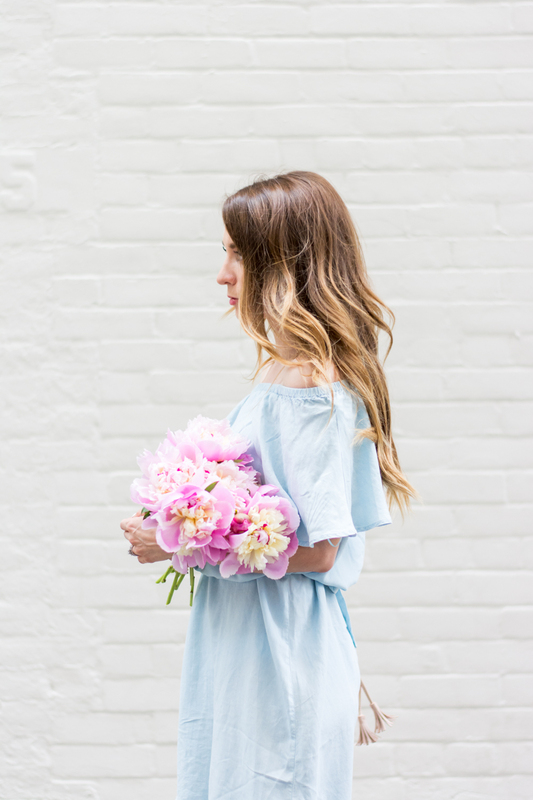 Thanks Eleni - it's definitely peony season! I think that we need another blogger crawl to celebrate. Celebrating summer weather that's for sure! Love this bag, and what a steal! Great price point since the quality looks top notch. Love the blue dress on you. Thanks so much Gabriella! I LOVE this bag, and it's definitely a great price point!